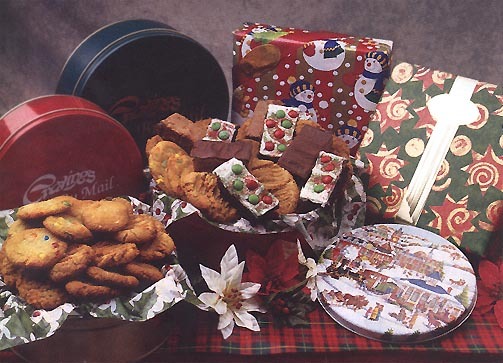 Send a gift of heart warming, home baked cookies from Cravings kitchen. Each selection includes your choice of mini cookies from our cookie section.1 Mom's Oatmeal Chewy's, 2 Cravings Famous Chocolate Chippers, 3 Grandma's Molasses Crinkles, 4 Oatmeal Raisin Walnut, 5 Peanut Butter Gems, 6White Chocolate Macadamia Nut, 7 Chocolate Chippers with Walnuts, 8 M&M Chocolate Chippers, 9 Heath Bar Crunch 10 Cranberry Orange Oatmeal Chewy's. Cravings Famous Chocolate Chippers and More! A traditional family favorite mini size.